A mélange of vivid color and bold prints in various scales. 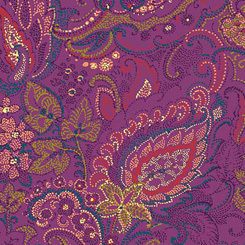 Dots of color sprinkled throughout create specks of color and give a textural effect to the florals and paisleys. Mixing and matching results in sophisticated yet carefree projects perfect for apparel, accessories and home décor.